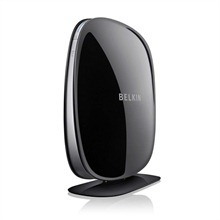 The Belkin N750 DB Wireless Dual-Band N+ Router gives you superior performance for home-theater video streaming and gaming. Featuring exclusive MultiBeam technology, Gigabit and USB ports, and dual-band speeds of up to 300Mbps + 450Mbps, the Belkin N750 DB gives you maximum throughput and multi-device coverage throughout your home. Updated wireless driver to improve peak wireless throughput. Improved long term router stability within UPNP environment. Media server now can be re-enabled after being disabled without the need for a reboot. Fixed virtual servers interface issues in the Firefox browser.